Choosing water polo over surfing was one of the most difficult decisions Kaleigh Gilchrist has ever made, but it was a path that led to being on the 2016 Summer Olympics gold-medal-winning water polo team. And now she’s using that experience to help surfing make its 2020 Olympic debut. WSL CT surfer Courtney Conlogue & water polo gold medalist Kaleigh Gilchrist at “Expression Session” for Olympic hopefuls. Both are former USA Surfing team members. Having competed at such a high level in both surfing and Olympic water polo makes Gilchrist a perfect USA Surfing High Performance Committee member. Before college and playing water polo at the University of Southern California and Team USA, she was selected for the USA Surfing team and won consecutive U18 Surfing America USA Championships in 2009 and 2010. Gilchrist wants surfing’s Olympic hopefuls to not only prepare for peak performances, but fully appreciate the Olympic experience. We caught up with Gilchrist, who had some advice. Q. Surfer to surfer — what would you tell other athletes about what it means to be part of an Olympic team? A. It means the world. You are a part of something bigger than yourselves and even bigger than your sport. You represent your country on the world stage. For me, that was representing the red, white and blue with teammates that turned into family and a sport that has given me so much. All the hard work and sacrifices paid off. 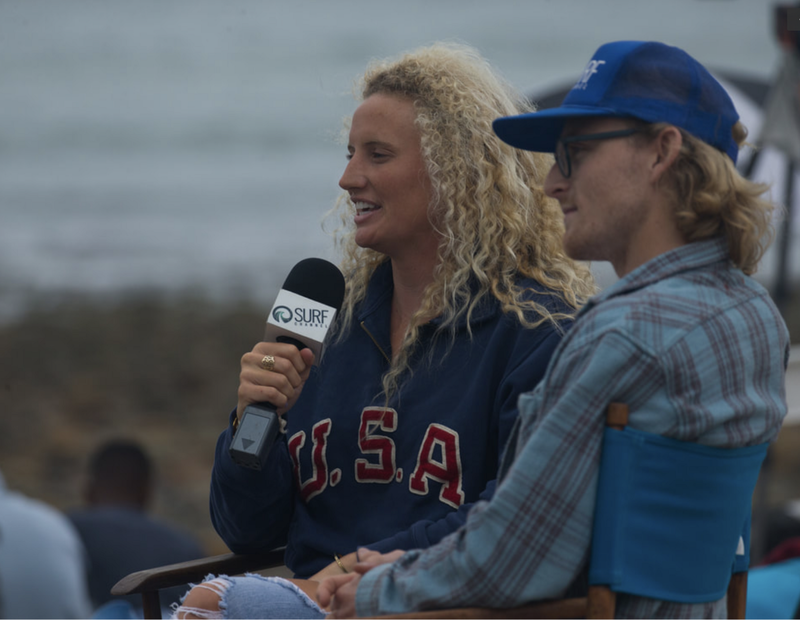 GIlchrist talks to The Surf Channel about surfing’s 2020 Olympic debut. Rio was an emotional time for me. I looked at it as a time of reflection on my 16-plus years of water polo. Everyone’s journey is different, but one thing is constant: They didn’t get to the top alone. I was fortunate to have so many people help me along the way. That support really culminated in Rio and I don’t think I will ever be able to thank everyone enough. Q. How will the Olympics compare to other surf competitions held around the world? A. You can’t compare it. How do you compare the biggest sporting event that happens every four years to a World Surf League contest that happens roughly once a month? The goal is still the same, score the highest two waves and win the contest, but the atmosphere and energy that surrounds the Olympic Games is unlike any other competition. My hope is that the surfers really embrace the spirit of Games and take in what it truly means to be an Olympian. Q. What advice do you have for preparing for Olympic surfing? A. All the surfers are already so experienced at competing on a high level and in high pressured situations that I think they will fit right into the Olympics. Like I said earlier, the goal is still the same. Enjoy the hype and atmosphere, but remember you are going out and doing what you know how to do so well, compete and perform. I would advise surfers, team managers, parents, coaches, etc.. to be proactive and have a plan a, b, c for the Games. There are a lot of moving puzzle pieces that go into the Olympics, especially a sport’s first. As an athlete, you don’t want to focus on anything, but the task at hand which makes the manager’s job that much more important. Lastly, enjoy. Take it all in. Go to the village, converse with other athletes from different countries. Go to opening and closing ceremonies. Have FUN. You are where people dream of being. Don’t let this opportunity pass you by. Q. What are some of the top lessons surfing can glean from other Olympic sports? A. For many athletes, the Olympics is what they train for their entire life. Those two weeks either make or break dreams. Many teams’ and individuals’ hard work for their entire life prior to the Games goes unnoticed. I think surfers can learn the importance and meaning of the Games from these other athletes, all while being even more grateful for the World Surf League and the platform and support they have to do what they love. Q. What can other sports learn from surfing? A. To be patient and present. Focus on the variables you can control rather than those you can’t. Surfing is an unique sport dealing with so many outside variables that other sports don’t quite understand. It is what makes our sport special, but can also be frustrating if you don’t know where to focus your attention. Q. You are part of USA Surfing’s High Performance Committee and helped develop a plan for giving Olympic surfers the very best support to perform at peak levels. What are some of the most important takeaways of the high-performance plan? A. The committee wanted to give the surfers all the tools necessary to be successful. With that being said, we understand that these athletes already have their own program, coaches, and ways. We don’t want to interfere with their programs that have already proven success, rather enhance them. I’m most excited for the surfers to dive into Michael Gervais and the sport psych aspect. Q. Competing in the Olympics runs in your family. Did your dad give you any advice? A. The entire journey of following in my Dad’s footsteps by going to USC and the Olympic Games was really special. However, he let me create my own memories and path to get to the same places. One thing he did do, is constantly remind me how fast it goes by and to give it my all so there would be no regrets when my sports career comes to an end. 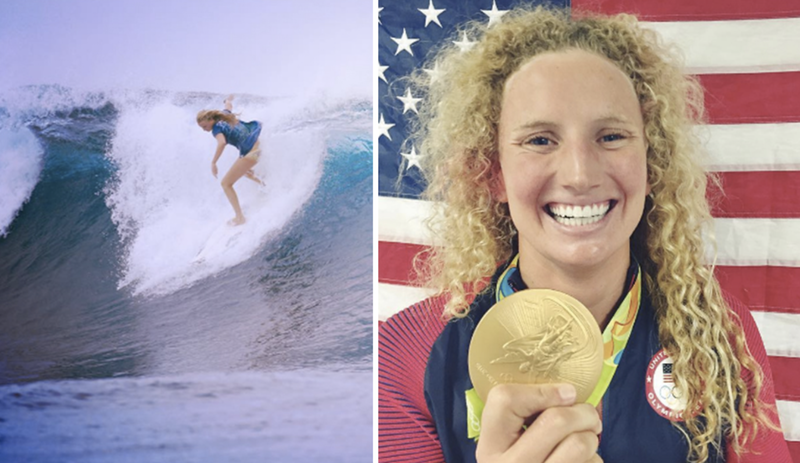 USA Surfing’s High Performance Committee — the nation’s leading experts in surf athlete training assembled to support the U.S. Olympic Surfing Team’s peak performance as the sport makes its debut in the Olympic Games Tokyo 2020.